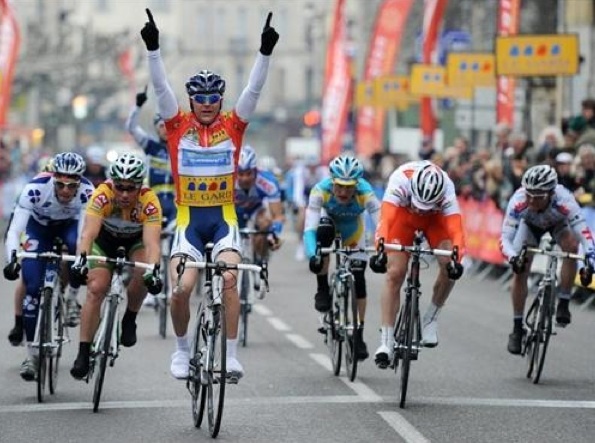 Bozic has deja vu all over again, wins stage 2 of Etoile de Besseges. Eh bah, c’est deju vu, mon vieux. How do you say groundhog day in French? Borut Bozic of the Sunny Vactionioners team (Vancasoliel) wore the same jersey, rode the same bike and got the same result, beating the same two guys in the sprint to St. Ambroix. This is his kind of vacation and the 40th edition of the Etoile de Besseges stage race is shaping up to be a Bozic favorite. Who’s the big etoile? The star is slovenian Bozic who continues to impress fans and depress the other fast men. Two first place wins, two bottles of champagne and already, so early in the season, four podium girls, flowers and kisses. Between Bozic and last year’s revelation Johnny Hoogerland, things look bright for the Sunny Vacationers. Directeur sportif Hilaire Van Der Schueren was obviously pleased the team executed his orders to the letter. The 29 year sprinter has the leader’s jersey, with time bonuses giving hims a 10-second advantage over Molmy and Eeckhout on general classification. The race was aggressive from the start but nobody blew doors until the French duo of Laurent Lefevre from the B-b-beat box Bouygues Telecom team and Benoît Vaugrenard managed to jump clear after 40 kilometers — but a 2 minute gap was all they accomplished. The chasers made the catch on the first of six 7.3-kilometre finishing circuits in St. Ambroix. Francaise Des Jeux’s Anthony Geslin and Yoann Offredo took solo shots at glory and were almost immediately slapped silly. They promised not to do that again in the near future. The teams of the sprinters took firm control for the final three circuits and then it was replay, deja vu, double your pleasure time for Borut Bozic. Should he win tomorrow, somebody’s going to claim he’s ready to beat Mark Cavendish. A least in France in early February in the Etoile. « Etoile de Besseges. Borut Bozic and Vacansoleil shine in stage 1.